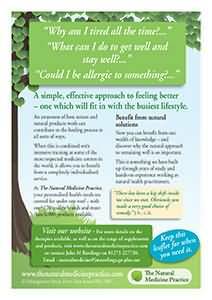 Download a brochure to find out more about how The Natural Medicine Practice can help you. This brochure gives a broad overview of all that’s available from The Natural Medicine Practice. Insight into how nature, natural therapies and quality products are employed to create a completely individualised service. An approach focusing on you, as a whole person. Explaining in easy to understand terms its origins, how it works and introducing the concept of broadcasts (distance transmission of remedies via hair sample). Our range of treatments, introducing Allergy testing, Vibrational medicine, Essences, showcasing Thai Yoga Massage and the concept of personalised treatment.